There are many effective bore cleaning methods. And each barrel is different. A hand-lapped Lilja 3-groove will show a fraction of the copper fouling as will a factory tube. Using moly bullets ordinarily reduces fouling, but moly requires a different cleaning method altogether (not covered here). And powder brands make a difference. Accordingly, there is no “one best way” to clean a rifle barrel. But here are some cleaning methods that work well, get the job done faster, and reduce the amount of wear and tear on your barrel. Here is what we recommend for an “average” factory barrel. After 25 rounds, or when accuracy degrades noticeably, spray some MPro7 or GM Top Engine Cleaner (TEC) down the bore from the muzzle. (Insert bore guide in breech first. Keep your MPro7 or TEC in a small plastic pump bottle for muzzle application). Let that sit a bit, then follow with a patched soaked with the same cleaner. Repeat. SharpShoot-R Carb-Out and Slip2000 Carbon Killer work really well also, when applied with soaking wet patches. Then, apply the same MPro7, TEC, Carb-Out, or Slip2000 generously to a bore brush, and run the brush through the bore 3-4 times, breech to muzzle. Allow some dwell time between strokes. Always use a wet brush. GM TEC cleans a little faster but it has some dangerous solvents, so handle with care. MPro-7 is non-toxic, non-flammable, non-corrosive, and biodegradeable. It comes in liquid or gel, and is also sold as “Hoppes Elite” cleaner. Carb-Out (from the makers of Wipe-Out) is new, but looks very promising. When used with a brush, it has removed baked-on carbon that usually requires abrasive pastes to remove. Here’s the brushing method we recommend: Pass the brush all the way out the tube, and unscrew it before the next pass. Brush breech to muzzle only. Do NOT draw the brush back down the bore. (A reverse pass, even with a “clean” brush, just drags fouling residues back into your rod guide, where they can be picked up and passed back into the barrel on the next forward pass.) Clean the brush and wipe off the shaft of the cleaning rod before each pass. After 3-4 brush strokes, run a damp patch through the bore again once or twice. Then run a tight-fitting dry patch to remove the carbon cleaner. The point of all this is to get 90% of the powder/carbon fouling out BEFORE you attack the Copper. And, always clean in a way that does not drag debris and fouling back in the bore. Next, if you have finished your shooting session, plug the breech and apply Wipe-Out Foam Bore Cleaner through the muzzle. It works best if, holding gun muzzle up, you give it about a 1/2 second squirt, then wait a bit for the bore to fill. Then give it another short jet for good measure. Put some tape over the muzzle, pack the gun up and drive home. After about two total hours dwell time, patch out the bore with a few dry patches. (If fouling is severe, you can let it work overnight). The makers of Wipe-Out say it has corrosion inhibitors so you don’t need anything else. But Wipe-Out is water-based so, for peace of mind, we recommend you put some Eezox or light oil on a patch and run it through the bore (we recommend Eezox). Before shooting the next time, dry patch the bore to remove any oil residue. Some folks like to run a patch with Lock-Ease graphite to help with Cold Bore Shot accuracy. Also, for a more reliable Cold Bore Shot, reduce Wipe-out dwell time so as to leave a little copper in the bore. If you need to clean faster, such as when shooting a match, run a couple patches soaked with Wipe-Out Accelerator through the bore before applying the foam. The accelerator reduces dwell time by roughly 50%. NOTE: We do not recommend using ANY foam bore cleaner other than Wipe-Out. We’ve seen evidence that Forester Foam and some of the domestic Wipe-Out imitators promote rust. If you use a foam cleaner, Wipe-Out is the ONLY correct choice. After getting the carbon out, as stated above, use a good copper solvent according to the product’s instructions. We like the Montana X-treme products (especially 50BMG solvent), Bore-Tech Eliminator, and Tom Meredith’s new “TM Solution” cleaner is very effective. 600-yard IBS Shooter of the Year Joel Kendrick tells us “TM” works really fast, “cuts carbon better than anything I’ve ever seen”, and has no annoying odor. But there are many other products that work well. Brush 4-6 strokes total with a solvent-soaked brush, cleaning the brush tip and rod as explained above. Again, do not drag the brush back through the bore from muzzle to breech, and allow some dwell time between strokes. Let the copper solvent sit in your barrel 5-15 minutes (per manufacturer’s instructions), then patch out. When all the solvent is gone, run a wet patch with Iso Alcohol through the bore, then patch out. 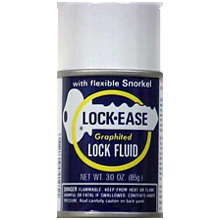 As a final step we run a very small amount of Eezox through the bore on a patch, but some people prefer using Lock-Ease, which is a colloidal graphite solution. Some people feel the graphite enhances your next cold bore shot. Using these methods, you can clean your barrel in 15 minutes or less of actual labor, and your lands will stay sharp longer. You also reduce the risk of damaging the critical crown area. For a custom match barrel, all you may need to do is run 4-5 wet patches with the general-purpose solvent of your choice (e.g. Bore-Tech Eliminator, Butch’s Bore Shine, TM Solution) through the bore, maybe not brushing at all. If you do choose to brush–don’t overdo it. Let the chemicals do the work. (Every pass with a brush can add micro-scratches in the bore.) Then dry patch and finish with a little oil on a patch. How frequently should you clean? Setting the round count between cleaning is up to you. Some top BR shooters clean every five rounds. Some Cross-course shooters clean every eighty. 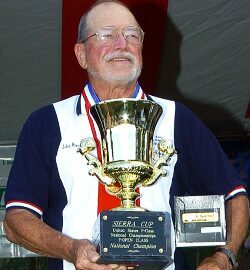 Some Palma shooters, such as Jerry Tierney, go 300 rounds or more between barrel cleanings. You have to see what works for you. During the “break-in” process for barrels, copper is the issue much more than carbon fouling, as you’ll probably be cleaning (and sampling bore fouling), every couple of shots initially. Wipe-Out, with its dwell time, isn’t really suited to this role. Bill Shehane of D & B Supply, recent 1000-yard Shooter of the Year, has to break-in scores of barrels every year for his customers and himself. 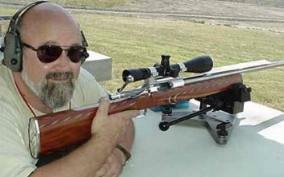 For barrel break-in, Bill says: “Montana X-Treme 50 BMG is the best copper cleaner that I’ve ever tried. The older I get the less I like to clean and the more I like to shoot. I want something I can break-in barrels with quickly and maintain them in copper-free and carbon-free condition after long heavy bullets lay the fouling to it. I have used all [the solvents] and they all work–some better than others and some faster than others. But none work as fast as Montana X-Treme 50 BMG. (I use a Hawkeye Borescope to watch for fouling). During barrel break-in, I normally shoot three-shot groups, cleaning in-between. One pass with 50 BMG is normally enough for each cleaning stage. I have never had a barrel that two trips with the 50 BMG didn’t do the job on, and most never take over one trip. I know they say [50 BMG] has oil in it but I ALWAYS follow with 1 patch of Montana X-treme oil before putting the barrel away.” When using 50 BMG, you’ll want to keep the cap on–the formula can lose some of its effectiveness if left open. Let me start by saying everyone has their own barrel-cleaning regimen. This is what works for me, and I don’t want to suggest that all Team USA members do the same thing. First, I’m not a fan of bronze brushes. I use nylon brushes. I have no proof that bronze brushes scratch barrels, but I feel that nylon has to be easier on a bore than bronze. However, I do sometimes use Iosso Bore Paste on a patch wrapped around a bronze brush. This is just used for cleaning hard fouling in the throat area. I usually do the Iosso thing after a match, typically three days of shooting and maybe 150-200 rounds. This is only in the 6.5-284 that uses bare bullets. My 6BR uses moly and the cleaning method is different. When doing a thorough bore-cleaning, I go after the carbon first, then the copper. 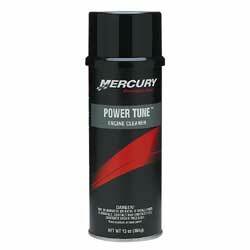 For cleaning carbon I use GM Top Engine Cleaner or Mercury “Quicksilver” Power Tune. These are both basically “carb cleaners” but they work great on barrels. The Power Tune comes in an aerosol can and you can spray it right down the muzzle if you want, though I usually apply it with wet patches. For general bore cleaning and copper removal I use a new product, Bore-Tech “Eliminator”. This is the fastest-working solvent I’ve ever tried–even the first patch will come out blue. I apply with a patch or directly on a stiff nylon brush, and use the brush to ensure I get a good coating in the barrel. After patching the Eliminator out, I’ll run a little Kroil down the bore if the rifle is going into storage. If I’m going to continue shooting after cleaning the barrel, I’ll apply some Lock-Ease colloidal graphite on a patch. I can’t say this has any effect on accuracy, but some of us feel it is best to have a little graphite in the bore to provide some lubrication for those first few shots after cleaning. I also like to remove powder/carbon fouling first, then remove any copper fouling that remains. This way you present clean metal to the copper solvent, so it works better with less brushing. When cleaning out copper, be patient, follow the directions, and let the solvent do the work. 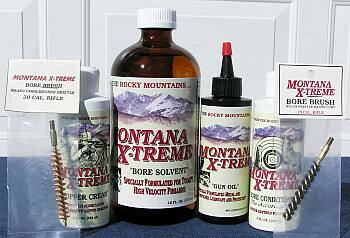 I like the Montana Extreme Products, particularly the Copper Creme, but there are many products that work. I’ve used Iosso Bore Paste to attack a spot of stubborn carbon build-up on occasion. Among the Montana X-Treme products, I use 50 BMG, the copper solvent as needed, and the bore conditioner or some other oil. I also like Shooters Choice Black Powder Gel on a bronze brush for carbon fouling. The bore cremes and Iosso should be used liberally on nylon brushes and stroked through the entire barrel for uniform cleaning. These products generally have gentler media such as talc, ground corral, or carbon/graphite but they are an abrasive and overuse can smooth the bore. Use liberal amounts of liquid solvent to flush them out of the barrel and always follow the manufacturers’ recommendations. Abrasive pastes should be avoided or generally only used occasionally just ahead of the chamber on centerfire rifles to correct problems in the throat. If you make a barrel too smooth it will copper foul like slick tires laying rubber on asphalt on a hot day. And remember–there are many effective means to remove copper, but nobody has figured out a way to put steel back in your barrel. Whenever possible, use chemicals rather than abrasives to remove copper. About Brushes–Both bronze and nylon brushes work. A bronze brush will definitely knock out stubborn carbon fouling easier, but in my barrels I normally use a nylon brush. This way you don’t get “false readings” from the solvent dissolving bronze bristles. Nylon brushes are also gentler on a barrel. You just may need more brush strokes with nylon. If you DO use a bronze brush, NEVER drag it back through the muzzle. When dragged backwards, the bristles can fret the delicate crown, causing small scratches that can degrade accuracy. Also, use good brushes. If the bronze bristles are bent or broken they can mar your barrel. Foaming Bore Cleaners–Yes they work and we recommend Wipe-Out for factory barrels that foul heavily. And while a good custom barrel may not need the copper-cutting power of Wipe-Out, foam cleaners eliminate almost all brushing, which reduces wear on the lands and crown. If you use Wipe-Out, definitely use the Accelerator also–it’s great! You apply that with wet patches down the bore before spraying the foam. It really does speed things up dramatically. Wait time is really the only downside to using Wipe-Out, but the Accelerator cuts that in half. We recommend the Lucas Cleaning-Rod Guide (photo left) and 100% cotton patches. Also, you should have jags in various sizes. This lets you run a loose patch for depositing solvent and a tight patch for drying out. The Tipton Multi-Caliber Jag Kit is ideal. Dewey, Bore-Stix, and Tipton Carbon cleaning rods are all good. Each has certain advantages and disadvantages. Tiptons are value-priced, however, and their carbon shafts seem to resist shaving better than plastic-coated rods. Whatever rod you choose, make sure it is correctly sized for the bore diameter and length of your barrel. Always use a cleaning rod bore guide, and take care to keep solvents out of the bedding and off your stocks.